Fishetarian, 599 Hwy. 1, Bodega Bay. 707.875.9092. Unless you're a fan of Cap'n Platters' fried fish and oceans of too-thick clam chowder, I find that most food at harborside restaurants doesn't live up to the views. 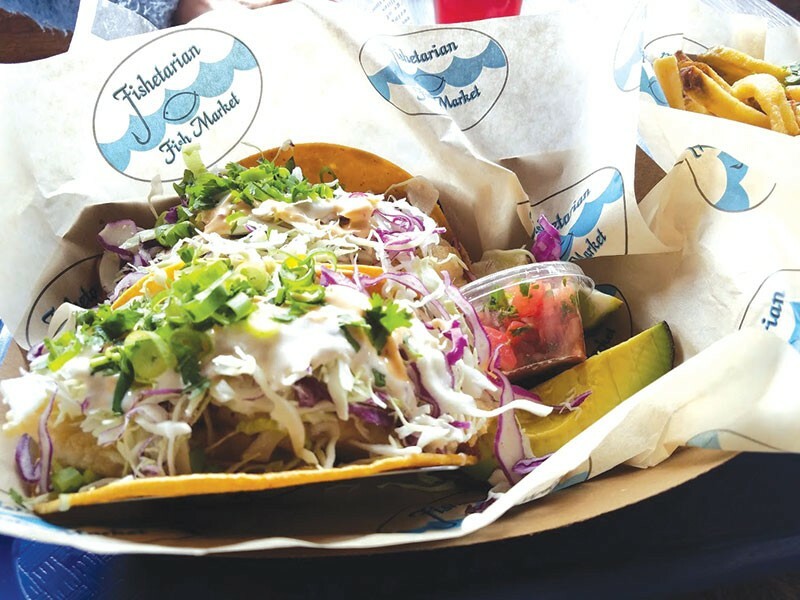 But in Bodega Bay, the Fishetarian is a notable standout and my go-to pick for out-of-town visitors who want a briny taste of what the burg by the bay has to offer—literally and figuratively. Co-owner Shane Lucas grew up in the seafood business. His parents opened Lucas Wharf Restaurant next door more than 30 years ago, and he has spent more than 20 years selling seafood. He knows his fish. And he knows his crab. Hands down, my favorite item on the menu is the crab sandwich. The burly sando goes for $15.99—not cheap, for sure, but the thing is loaded with sweet, Dungeness crab. It's mixed with a bit of creamy mayo, but it's really just a whole lot of crab, no filler. The only knock on the sandwich is the bread—there's too much of it. It's an excellent ciabatta roll, but thin slices of toasted sourdough would be a better showcase of the crab. My second choice is the rockfish sandwich ($13.99). Available grilled or fried (go for the grilled), the fish is sourced from local waters—Ft. Bragg on my visit. Then there are the rockfish tacos ($12.99). Like the sandwiches, the twin tacos are bulging with fresh fish. Chipotle mayo, avocado and pico de gallo seal the deal. I love a good clam chowder, but not when it tastes of nothing but heavy cream and potatoes. That's not the case here ($6.50 for a bowl). The soup has a lighter, thinner consistency, and the briny bite of clams comes through. The addition of chopped cilantro and green onions on top seems like a small thing, but it works as a foil against the richness of the soup. I also had an excellent bowl of curried crab and corn chowder (a daily special) on a recent visit. Not in the mood for fish? The "adult grilled cheese sandwich" is for you. Loaded with Estero Gold and Highway One cheese made at Valley Ford Cheese & Creamery just down the road, the molten concoction combines the gooey cheese with grilled onions and fig jam ($11.99). Damn! As good as the seafood is, the beverage program at Fishetarian is far from shabby. There are half a dozen local beers on tap, as well as kombucha and row upon row of bottled beer in the help-yourself reach-in refrigerator. If you're an artisanal soda geek, this is your place. The number of shelves dedicated to root beer alone is astounding. Fishetarian gets extra points, too, for its choice of plates and cups. Everything is compostable and biogradeable. No styrofoam clamshell boxes here. Given the long lines that stretch out the door most weekends, the amount of landfill-bound trash that would be generated here would be voluminous if Lucas and company weren't conscientious. Thumbs up to Fishetarian for doing its part in not contributing to the gyre of plastic trash spinning in the Pacific Ocean. Think about that as you gaze into Bodega Bay, enjoying your lunch.